The present volume has been dedicated to the memory of Wilhelm Seidensticker (1938–1996). 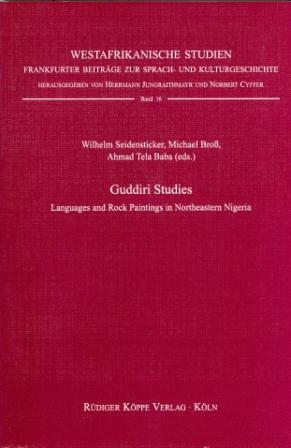 It contains five contributions by Nigerian and German scholars on the history of language and culture of the Guddiri region in Northeastern Nigeria. Being situated between the powerful Hausa city states westwards and the kingdom of Borno eastwards, the Guddiri region functions as a sort of buffer zone and has been exposed to frequent changes in prevailing economical and social circumstances during the last centuries. The linguistic and cultural changes are examined on the basis of three different kinds of sources: Firstly, linguistic sources are taken into account, among them ancient word lists which have been discovered only recently. Another source material is oral traditions which were recorded by civil servants of the colonies at the beginning of the century. And finally, the well-known rock paintings found in the regions of Bauchi, Birnin Kudu, Shira and Uba in Northeastern Nigeria serve as the third kind of source material for this study. Concluding, it can be stated that the book indicates the lack of written sources does not prevent reliable reconstructions, whether of linguistic or other types. “Guddiri Studies” is a painstaking study of this kind, containing thorough analysis, oral tradition supports linguistc data, the latter make historical facts manifested in rock paintings credible.